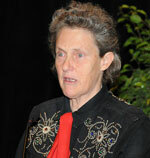 Dr. Temple Grandin will give the keynote address at the I-29 Dairy Conference in Sioux Falls, SD this week. Grandin is a doctor of animal science and professor at Colorado State University, bestselling author, and consultant to the livestock industry on animal behavior and was the topic of an Emmy-award winning HBO movie. She will speak at the conference on Wednesday evening, followed by a full slate of industry speakers focused on animal well-being and sustainability on Thursday.